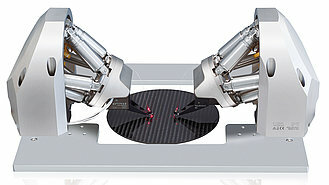 Ideally adapted to the requirements for the interactive alignment of optoelectronic components: Graphical representation of defined area scans and scan results. Monitoring the measured intensity signal. Saving and loading settings. 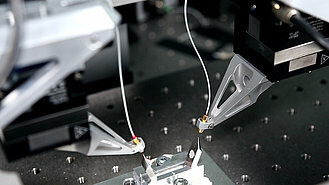 Flexible configuration. For alignment systems with a maximum of six motorized axes for long travel ranges and three piezo-based axes for fine alignment. Recommended systems from PI: F-131.3SD1 with three axes each for coarse and fine alignment, F-122.5DC with five motorized axes. Supported controllers: C-884 for motorized axes, E-727.AS for piezo-based fine positioners. Many other system configurations on request. Suitable for PCs with Windows operating system. Command and programming knowledge is not required for installation and operation. PIMikroMove or similar software must be used for startup and parametrization of the alignment system. The software is subject to a charge. The license allows use of one C-884 and one E-727.AS controller respectively and is linked to the serial numbers of the devices. 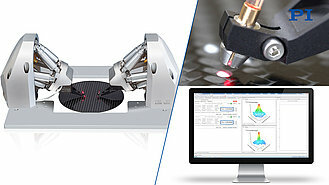 PI FA1 Alignment Tool, software for aligning optoelectronic components; for use with the C-884 controller for motorized axes and the E-727.AS controller with fast alignment routines (spiraled area scan) for piezo axes with strain gauge sensor.